However, furious pro-Brexit MPs criticised Brexiter cabinet ministers, including David Davis, Liam Fox and Andrea Leadsom, for failing to take a stronger stand against the government's proposed offer to the European Union, including quitting the cabinet. Mr Davis shocked the Prime Minister by telling her he could not support the Brexit plan agreed at Chequers on Friday, prompting speculation that a wave of Cabinet resignations could follow. Britain's Secretary of State for Departing the EU David Davis leaves 10 Downing Street in London, June 7, 2018. The resignation was swiftly followed by that of Steve Baker and Suella Braverman, who are not members of the Cabinet but were the Brexit Department's other elected Brexit supporters. Arch-Brexiteer Jacob Rees-Mogg hit out at the "defeatism" in the Government's plans, warning that he would vote against them - and suggested other Eurosceptics may do the same. Mr Davis had disagreed with the PM's plans for keeping European Union rules for goods and adopting a close customs partnership with the other 27 member countries. 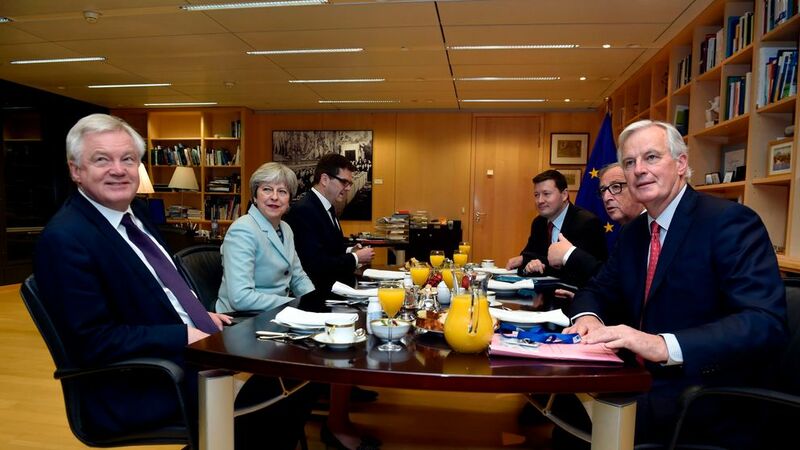 In that meeting, May had appeared to win over her fractious cabinet and secure approval for her plan, which was to be published as soon as this week in a lengthy white paper that would stake out Britain's vision for future relations with Europe. A letter reported to be circulating among Tory MPs on Sunday is said to accuse her of "complete capitulation" and making promises that were "a pretence and a charade meant to dupe the electorate". - Davis led Britain's negotiations in Brussels on the terms of the European Union divorce, and the future relationship with the bloc. Writing in The Daily Telegraph on Monday, Mr Rees-Mogg said: "If the proposals are as they now appear, I will vote against them and others may well do the same". Opposition lawmakers, meanwhile, said that this was a big blow for the prime minister. Appearing on the BBC's The Andrew Marr sShow on Sunday, he said: "I'm a realist and one of the things about politics is you mustn't, you shouldn't, make the flawless the enemy of the good". Hours after Theresa May's Chequers peace summit, her Brexit strategy is once again left in tatters. "Those of us who believe that we want to execute a proper Brexit, and one that is the best deal for Britain, have an opportunity now to get behind the prime minister in order to negotiate that deal", he said. On Friday, May achieved a rare consensus in a key cabinet meeting at her Chequers country house estate on the way forward for the negotiations with the EU. Conservative MP Peter Bone said Davis had "done the right thing", adding: "The PM's proposals for a Brexit in name only are not acceptable".